Conspiracy of Venus perform this Friday, Jan. 13, at the Red Poppy Art House. "Vocal ensembles" and "forward-thinking" aren't often spoken together in the same sentence. But then, most vocal ensembles aren't Conspiracy of Venus — a 30-strong all-women's vocal ensemble who perform (mostly) a cappella renditions of unconventional modern pop standards from relentlessly singular artists (think Björk, Tom Waits, Leonard Cohen, Joni Mitchell, and David Bowie), plus original compositions by the ensemble's director, Joyce Todd McBride. The end result makes the new feel old and the old feel new, a delightful bit of cognitive dissonance which proves there's much more to the vocal ensemble than one might associate with college a cappella groups and barbershop quartets. Conspiracy of Venus was founded in 2007, a sister group to the all-male Conspiracy of Beards, a vocal ensemble with a similar schtick. (The Beards, it should be noted, perform the works of Leonard Cohen exclusively.) After several years performing in and around the Bay Area, Venus released their debut album, Muse Ecology, in February 2016. 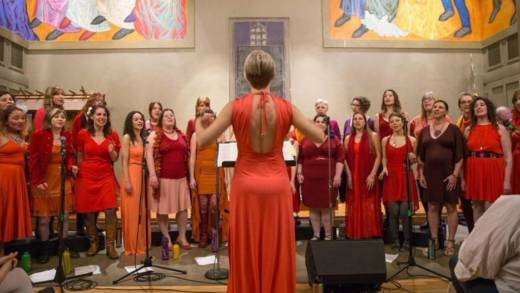 Arranged by McBride, and including a number of her own original compositions, Muse Ecology shatters expectations about what vocal ensembles sound like. For one, the album isn't strictly a cappella — interlocking vocal harmonies obviously account for the majority of its musical content, but jazzy flourishes (upright bass, marimba, drums) abound. Here, instrumentation buoys the singers' voices, never overwhelming them; its inclusion feels like just another rule that Conspiracy of Venus are happy to break. Of course, Venus's rulebreaking wouldn't matter much if the music wasn't up to snuff -- it is, in spades. Thanks to McBride's smart, tight arrangements and the lush, full range of the ensemble's 30 vocalists, Conspiracy of Venus's renderings of modern favorites, like Björk's "Possibly Maybe," will make you hear the originals in a whole new way. And realize, perhaps, that vocal ensembles are cooler than you thought.